When I left Canada nearly six weeks ago it was with the promise that I would be blogging nearly every day. I said that I was going to be traveling around the country on the week-ends, I would be taking a ton of pictures, and I would be blogging about my experiences. I have been busier with work than I anticipated. It has all been a good kinda busy, but busy nonetheless. My accommodations, while not generally uncomfortable, are, for me, not conducive to writing. While in many ways the trip has been going extremely well, I suppose I have been in a bit of a funk. My regular readers will know that I spent a wonderful week-end in Kyoto a few weeks ago. I have taken two day trips to see Mount Fuji, and to experience the areas around the mountain. While Shibuya is in Tokyo, I spent two incredible evenings over Halloween taking pictures there. I have booked an evening next Saturday in Nara, so I will get there by train earlier in the day, toddle around, and in the morning I will take another tour. Now, I should mention that between my two trips to see Mount Fuji, or Fuji-San as it is referred to here, both of them were to one degree or another a bust. On my first trip the weather was completely overcast… from the moment I got up in Tokyo until the moment I went to sleep the rain and clouds did not abate. 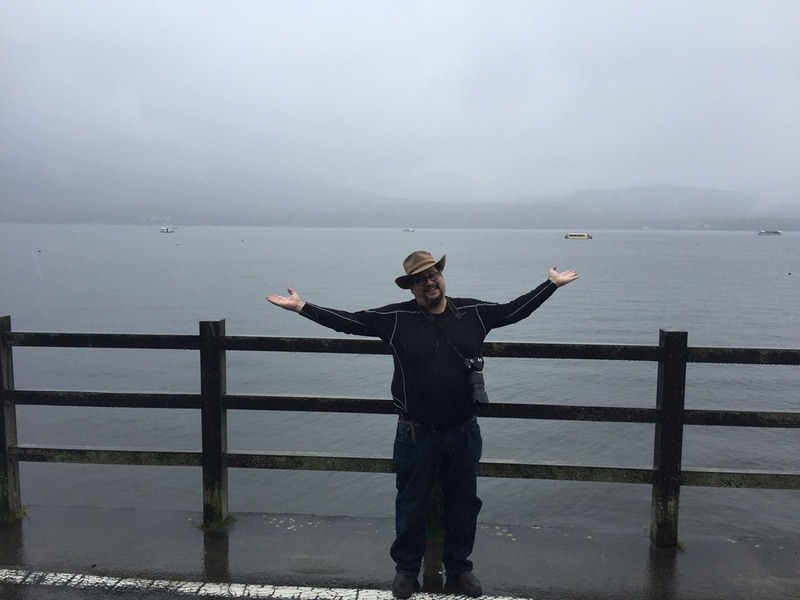 This picture, taken on the shores of Lake Yamanaka-ko, shows Mount Fuji in the background… if you are able to see through the clouds, which I am not. That doesn’t mean that I didn’t have a great time on the trip. Simon and I met at the train station where we rented the car, and took the scenic route into the country. Our first stop was the Japanese equivalent of a Rest Area… only it was not the generic, cookie-cutter type area that I am used to. 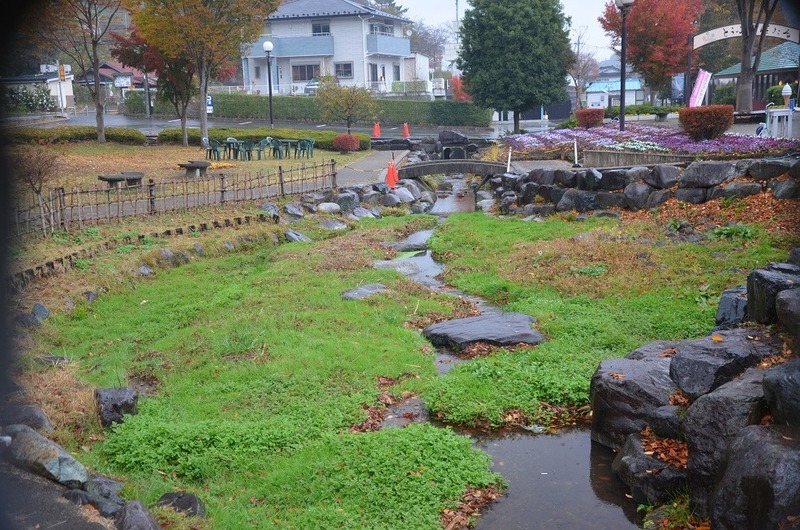 It was called the Doshi Service Area, and it was gorgeous, relaxing, and very… restful. It was built on the banks of a stream, and offered an opportunity to take some great pictures. Although there was ‘fast food’ available for purchase, there was also a delicacy of fish grilled on a stick. I opted for a bag of crisps instead. As we drove along the Pacific Coast (on the Tokkaido Road. What was once the ancient roadway during the times of the Samurai is now a nice stretch along the ocean with tourist spots and surfing and sun bathing. According to one of my friends, you have to be very aware of the hawks along this stretch… not because they are a danger to you, rather because they will steal your food right out of your hands. I was tempted to stop and pick up a sandwich just to experience this, but I decided to put that aside for another day. We stopped for lunch at a traditional Japanese Soba restaurant. 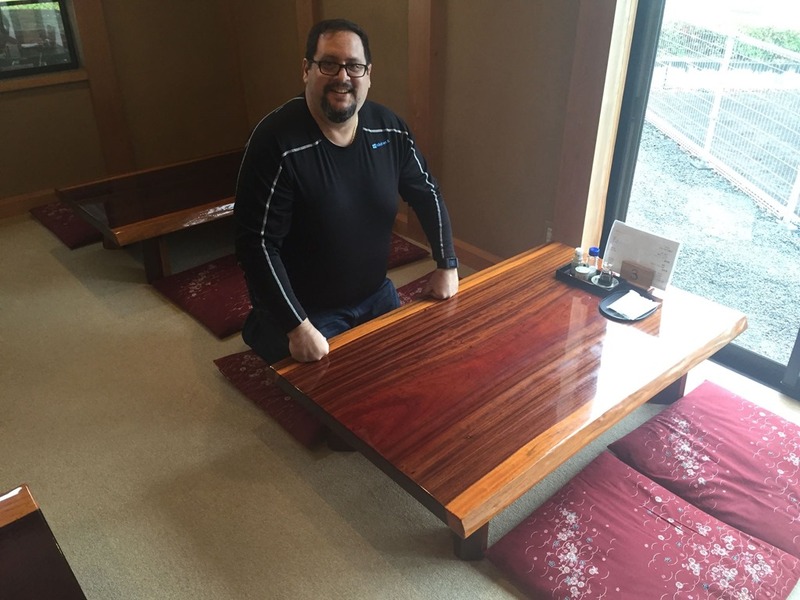 I had experienced several ‘authentic’ Japanese restaurants where you seemed to sit on the floor, but under the table there was a hole to put your legs and sit normally. Not here… You could sit cross-legged, on your knees, or straight-legged with your legs under the table if you wanted, but this was the real deal. They cut their soba noodles by hand, and you could order any drink you wanted… as long as you wanted tea. It was a wonderful experience, and even if I hadn’t been pretty comfortable, it was my goal to experience the real Japan during my stay. This is as real as it gets! After lunch we went for a tour of the Kirin Gotemba Distillery. We got to see how they make and store whisky, and at the end of the tour we got to taste it. While it was a nice experience, I think the whisky they produce there (yes, they are blends) are sub-par. They gave us two drams, neither of which was worth my time. I did however buy a set of six whisky glasses for my bar at home – the base has a 3D carving of Mount Fuji, which when you pour your liquid in takes on that hue. Truly very nice, and I hope they survive the plane ride! …And then we arrived at the highlight of the day trip. The best thing that could possibly have happened on this rainy Sunday afternoon. We arrived at the Onsen. If I had to pick one thing that the Japanese do soooo much better than anyone else, it is the Onsen. The mountains around Mount Fuji and Hakone are quite volcanic. Because of that, and I expect because of their proximity to the ocean, there is an abundance of hot springs. The onsen is a hot spring bathing area. You enter, removing and storing your shoes at the entrance. You are given a wrist band which is good for everything… it is your ID, but it also has a bar code so that anything you want to buy while on the premises (and aside from the restaurant there is also a gift shop) will simply be charged to your account – in other words, you can walk around in a towel, go in and out of the baths, and do anything you would like without having to carry or go get your wallet – or worry about it getting wet. I mentioned I had taken two trips to Fuji-San; as wonderful as the first was, the second was essentially a waste of time and money. Simon, who took me the first time, knew exactly where to go, what routes to take, and so on. What he did not know, he asked. My second trip was taken with a friend Jay who reminded me of… me, twenty years ago. He thought he knew everything, refused help, and because of that we spent nearly five hours driving (to the wrong spot) and arriving with a very half-decent view of Fuji three minutes after sundown. In other words, we saw the top of the mountain far in the distance… but not well enough to take a picture. I did get a couple of decent shots of the lake… but that was not what I traveled for. Oh well, live and learn. While I started writing this article a few days ago, it is now Saturday at 12:26, and I am on the Shinkansen (Bullet Train) bound for Kyoto, from where I will transfer to the train for Nara. I am looking forward to my last weekend in Japan… even though I am dying to go home already. This trip was too long without seeing my family. Who would have guessed it by the way… After two failed trips, I just got some absolutely breathtaking pictures of Fuji-San from the train! Wow, I feel blessed. The mountain is truly a sight to see. I am also blessed because this afternoon (or tomorrow morning) I will have the opportunity to feed the deer in Nara Park, and if you know me, you know I love wildlife! A couple of months ago when I realized I was coming back to Japan I set certain goals for myself: I wanted to take a lot of pictures, I wanted to travel outside of Tokyo almost every weekend, and I wanted to blog a lot. While I do not feel like I did a good job on achieving these goals, I didn’t do too badly. I had seven weekends here, and I left Tokyo for four of them (although two were day-trips without an overnight). I didn’t blog nearly enough, but that was in part because I have been very busy with work, and have not had the proper work area where I am staying to do so. I have taken some breathtaking pictures though… not only of Fuji-San, but of nature, temples, shrines, and people. It has been a wonderful experience (if a bit too long), and I am thrilled to have lived it. I am also thrilled that in four days I am getting on a plane and coming home. I will try to write another article, this time about Nara, on the train back tomorrow. Unfortunately I did not bring my SD-Card Reader (www.juicedsystems.com) with me, so if I am going to include pictures I will not publish until after I am back. However whether now or later, I promise you will see them!